UPDATED: Thu., March 22, 2018, 10:21 p.m. The Seminoles pulled away late, using an 8-1 run to build a 67-55 lead. Mfiondu Kabengele started it with a pair of free throws and Phil Cofer added another after stealing Corey Kispert’s errant inbound pass. Terance Mann added a bucket from close range and Cofer’s dunk extended the margin to 66-56. 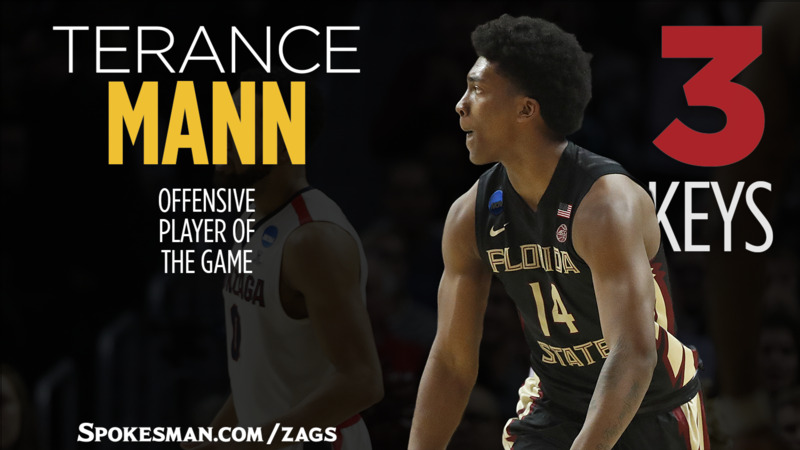 FSU junior guard Terance Mann, who has been battling a groin injury, came up with 18 points, including three dunks in the second half. Mann finished 8 of 13 from the field. He was the lone Seminole to reach double figures. Senior guard Braian Angola, a North Idaho College product, did a nice job guarding Zach Norvell Jr. The Zags’ redshirt freshman wing scored 14 points, but made just 4 of 16 field-goal attempts. Norvell also had four turnovers. Published: March 22, 2018, 10:12 p.m. Updated: March 22, 2018, 10:21 p.m.